Sisters, Crystal and Julie, are the owners of the sweetest etsy shop called Icing on the Cupcake. Here you can find an assortment of original artwork, home decor and baby and children’s items. I am in love with this shop and think they have the cutest things that would look so precious in a baby or kid’s room. 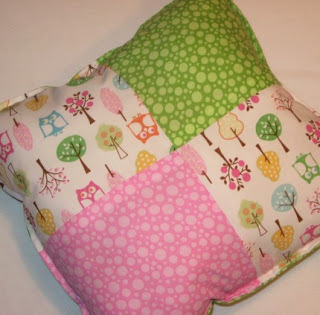 Don’t you just love the colours in this pillow? 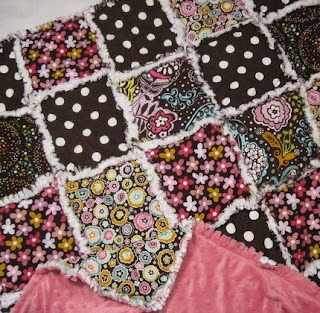 This quilt is sooooo beautiful- I want it!! My sister and I both love to express our creative sides through many different forms of arts and crafts! My sister has been sewing since she was a child. I like to dabble in a little bit of everything, mainly sketching and painting. We have been fortunate enough to have a creative and supportive family background. Our grandmother sewed sweet little dresses and outfits for each of us throughout our childhoods. She has passed along her sewing talent to both of us, along with her thriftiness for finding use in anything! Our mother has wonderful artistic skills and loves to make her own jewelry… soon to have her own Etsy shop! We started Icing On The Cupcake a little over a year ago. I had recently quit my full-time job, to stay at home with my son, and wanted to find an outlet to sell my art. My sister still works full-time and creates items for our store as a hobby. We have collaborated to offer boutique quality children’s items including blankets, feeding accessories, original artwork an more. Icing on the Cupcake has offered one of my readers a chance to win an 8 x 10 art print of their choice! There are so many choices that it’s hard to just pick one. 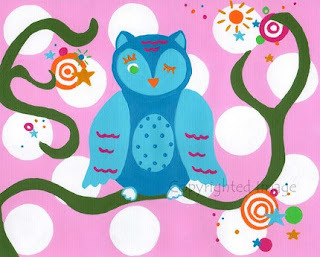 I think if I were to choose my favourite it would be A Little Wink Owl Art Print.